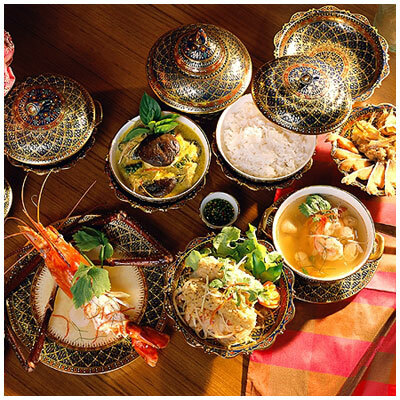 Thai food has become in recent years one of the world's favorite cuisines. When we speak of "Thai food ", we are in fact talking of four very distinct regions in the country, each with their own culinary traditions. We are speaking too of the dishes created in the royal courts and palaces of Old Siam, that have been passed down through many generations of chefs, and finally into public domain. Good food also comes up from the street level, and many of Thailand's most popular dishes can be found at the smallest food stalls and restaurants. And there is the influence of China, India, Malaysia and other neighbouring countries. So all these different factors come together under the label "Thai food", and you will find them in varying degrees at any Thai restaurant you care to visit, anywhere in the world. One of the most distinctive aspects of the cuisine is its use of herbs and spices. With regard to the spices, some Thai dishes are very hot, but by no means all of them. The herbs have another function, in addition to providing flavour, in that they all have to varying degrees various medical and therapeutic benefits. Thailand has a long history, going back to ancient times, of the use of herbs for medical purpose, and this in turn has permeated the ways of cooking and preparing food. Coupled with its low-fat qualities and its essential freshness, this helps make thai food one of the healthiest anywhere. Another important aspect about Thai food is the hospitality and friendiness, the sheer enjoyment of good companionship and of eating that is such a powerful element of the Thai personality. Sharing a meal is an important part of the day for any Thai person, and meal are very seldom taken alone. That is why all the dishes are generally served at once during Thai meal, and why there is a communal spoon placed alongside each dish for people to help themselves and to serve others. A Thai meal ideally is a communal affair, principally because the greater the number of dinners the greater the number of dishes that can be sampled. Diners choose what ever they require from share dishes and generally add it to their own plate of rice. All the dish are serve simultaneously, or nearly so. The object is to archive a harmonious blend of the spicy, the subtle, the sweet and sour, and a meal is meant to be equally satisfying to the eye, nose and palate. Thailand is blessed with many varieties of plants, herbs and spices which ensure s balanced diet. Today, visitors can both relish classic Thai menus and the benefits of a natural diet, and study the art of Thai cooking at several specialist schools in Bangkok and major beach resorts.